Last year, Natalie and I attended a prayer gathering in Sevierville and heard Pastor Steven Furtick of Elevation Church in Charlotte, North Carolina, among others, preach the gospel and encourage the saints. It was during one of the services that Pastor Steven made this statement, “God is sick of us praying anemic prayers. He is waiting on us to make the BIG ask.” I thought about those statements for many months and decided that he was right. God wants us as His children to ask the BIG and seemingly impossible things of Him. Then, we’ve given God an opportunity to show up, show out, and receive GREAT glory. 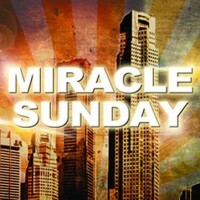 On Sunday, March 18th, we will be celebrating this year’s MIRACLE SUNDAY. It is the one service of the year that we call on the body of Christ at Bridges of Hope to pray, fast, and give sacrificially to meet specific needs. This year is no different. However, after much prayer and seeking God’s face about the matter, let me tell you what is different. The elders feel that God is leading us to make the BIG ask of Him. In other words, we are asking God to do something so BIG for us on this particular Sunday that it will be evident that it was God that did it. On Sunday, March 18th, we are asking and believing God to give us $60,000 to make some much needed ministry upgrades to enable us to reach more people for Christ. So, where’s the money going to be spent? That’s a really good question. 1. Every several months, we are having to spend $3,000 to $4,000 to replenish the gravel on the parking lot as it washes out quickly. As you can tell, we have huge lakes that people have to swim across to get into the building when it rains. We believe it’s bad stewardship to keep throwing that money away. So, for approximately $50,000 we can put in lighting for the parking lot, pave it, stripe it, put in curbs and parking bumpers, new handicap and guest signage. This would make our church more appealing to guests when they arrive and give us more parking capacity. 2. We also want to put speakers out front so that it sets the atmosphere to hear praise music as you approach the building. 3. We would be installing a TV monitor in the foyer, TV monitors on the stage, speakers in the bathrooms, and connecting a LIVE feed to the youth room for future overflow and for the Hope Café. 5. We would also be able to install electricity and lighting to our out building, lights for our sign, and electricity to our flashing sign out front. As you can see, much can be done with $60,000. So, we are asking you to begin praying and asking God to allow you to be part of this year’s MIRACLE SUNDAY. You can make a difference! Will you?